In a few short years E Ink has turned into a company that's synonymous with the sector they are in. It's the Hoover, Blu-tac, Biro, Filofax, Sellotape of the ereader world. Its technology is currently in 93 per cent of all ereaders and a recent buyout of its nearest rival SiPix should see the market completely sewn up by E Ink. But the problem with saturation is there's an end point and this is where some creative thinking has to take place. "The ereader market has been tripling in volume since 2007 but not this year," explained Siram Peruvemba, E Ink's chief marketing officer, to TechRadar. "It is partly to do with tablets but the biggest reason is that the economy is off at the moment… we have also seen not as many product launches as last year and the year before." Fewer ereader launches in the market coupled with factories that are ready and waiting to output more stock has meant that E Ink has found itself in a whole heap of gadgets and gizmos over the last few years. From watches to credit cards, it has been putting its stamp on 'dumb' items and making them smart and it's hoping to bring its technology closer to the home in the near future. "We believe that E Ink will come to home appliances. We are thinking differently – we want E Ink on every surface. "There are a lot of dumb surfaces around and by adding the E Ink technology we can transform them, by adding a display and making them smart. "We are going to keep going in that direction, enhancing products. Whether it is animated shelf labels, USB keys… drills." And with that Peruvemba showed TechRadar a drill concept the company was working on, where data such as power life and the like was shown on the screen. He did explain that while this may never see the light of day – "We create a lot of these concepts and some of them go nowhere, while some are picked up" – the company continues to create prototypes to show how versatile E Ink technology can be. It also seems that sometimes an E Ink device created for one specific market may take on a wholly different guise when it is finally released in the wild. "One concept that was picked up but not how we originally intended was our E Ink lock," said Peruvemba. "This was originally pitched as a bicycle lock, where it could tell you if your bike was locked properly or not. It's very low powered, just an E Ink display with a hole in the middle. But it just didn't get picked up; no one in the bicycle world wanted it." "And then a company called InVue decided to take it on and use it for cabinet displays, it's virtually indestructible so no more broken keys – alleviating a problem that retailers have with their cabinets." This move away from ereaders doesn't mean that E Ink is not innovating in the market it continues to dominate. The latest kindle to be launched, the Kindle Paperwhite, shows that E Ink can compete with tablets when it comes to display. Using E Ink's Pearl technology and LED lighting it means you can use your Kindle in the dark, but still offer a screen that's easier on the eyes – something tablets just can't do. But there's another innovation out in the market which may point to the future of ereaders, and that's the Wexler Flex One. Released in June, this is the world's first flexible ereader and despite its minimal impact in a market dominated by Amazon, Peruvemba believes these durable ereaders that can be thrown around without fear of breaking could be perfect for schools, especially in developing countries where textbooks are scarce. "I am convinced that every single book in every single school in the world will be replaced by an ereader," explained Peruvemba. "The publishing world still makes a lot of money. Publishing textbooks still make a lot of money so it will take a while for the model to change. "But in Africa and other places, they don't have the money to purchase these textbooks. Potentially with an ereader they can download a million books for free." 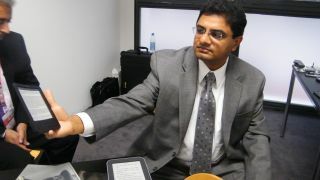 Although Peruvemba didn't reveal if any schools had dropped textbooks for ereaders completely he did note: "Feedback from schools is that an ereader is less distracting than using a connected device, like a laptop or tablet. "With those you pick up bad habits by checking the web, watching videos, downloading viruses. "With an ereader the only bad habit you pick up is this thing called reading. And it seems that ereading is making people read more. "Kids look at ereaders and see them as toys and find it cool to read on these devices." One final place where we could see an E Ink screen is on the back of a mobile phone. Again, it's E ink's mantra of making a 'dumb' space smart. According to Peruvemba an additional screen on a mobile could be exactly what consumers need. "Most of these mobile phones have nothing going on on the back. "We can add another display at low cost on the back of the device and offer things like clocks, stock information." Peruvemba also hinted: "There are vendors looking into this technology – it is very new but typically we should see this type of concept come within the year." Looks like the world is going to be E Ink stained for some time to come.